© Edward Burtynsky, courtesy Nicholas Metivier Gallery, Toronto / Von Lintel Gallery, Los Angeles. Edward Burtynsky, Salt River Pima-Maricopa Indian Reservation / Suburb, Scottsdale, Arizona, USA, 2011. From the series Water. © Edward Burtynsky, courtesy Nicholas Metivier Gallery, Toronto / Von Lintel Gallery, Los Angeles. 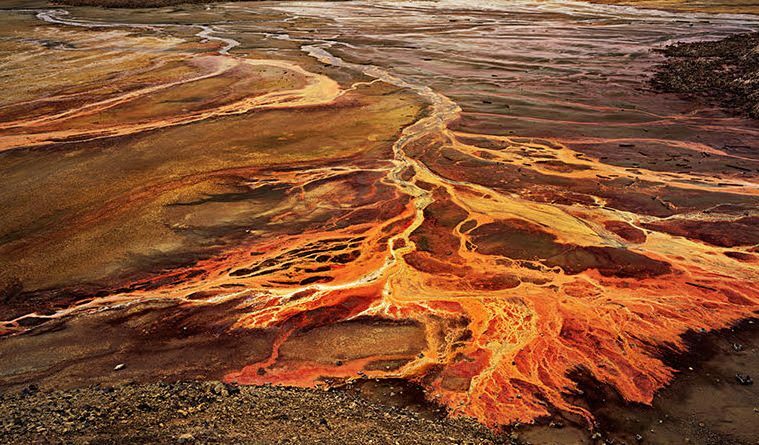 Edward Burtynsky’s photographs reveal the epic scope of man’s relationship with nature. 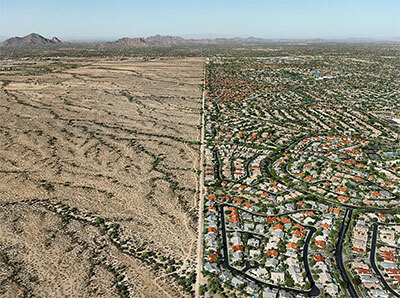 The desert expanse on one photo’s left side confronts the packed Arizona suburb on the right. In another image, a placid little lake occupies the bottom of an open-pit mine. Maroney aims to mirror that duality in his new Earth Music, co-commissioned by FotoFest — whose “Changing Circumstances” exhibition includes a broad span of Burtynsky photos — and Musiqa. 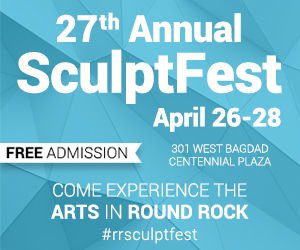 The new-music group premieres Earth Music on April 7 amid Burtynsky’s photos in The Silos at Sawyer Yards; April 9, Maroney’s work will share a Musiqa program in Zilkha Hall with works including another new piece, Rob Smith’s Angenieta. Sidestepping conventional instrumental groupings, Maroney has cast his work for clarinet, double bass, piano and percussion. “It’s a very dark piece, and I wanted the richest colors I could get,” he says. And even though Earth Music is a quartet, it unfolds on a symphonic scale, with a big opening movement leading to a slow movement, then a scherzo. The first movement includes a tip of the hat to Maurice Ravel, who composed a piano work called Une barque sur l’ocean, or “A barque on the ocean.” Maroney, who crafted his quartet’s opening with images of the Gulf of Mexico in mind, calls it Une barque sur l’huile — floating the boat on oil. 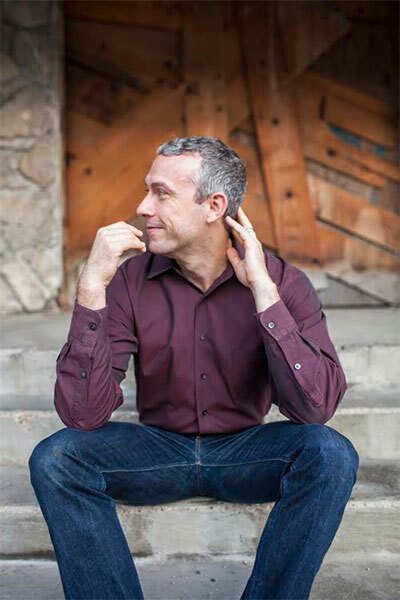 Harmonies borrowed from Ravel’s piece help tie together the entire quartet, Maroney says, and the work encompasses not only starkness, but beauty. To translate that blossoming spirit into music, Smith draws on Bist du bei Mir, by J.S. Bach, Lohuizen-Meijer’s favorite composer. Taking the song’s melody as its foundation, the eight-minute quintet — for string quartet plus double bass — hews closely to Bach’s graceful theme at the outset, Smith says. But as Angenieta develops, it grows freer and livelier, like its namesake. 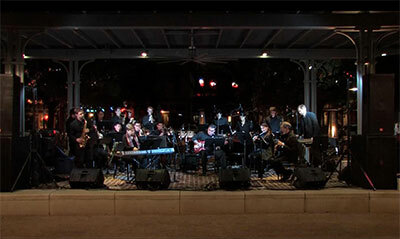 Musiqa will marshal a platoon of six percussionists for its season finale June 3 at Market Square Park. The group will perform Timber, by New Yorker Michael Gordon, whose work harks back to the simantra — a long wooden bar used for centuries in Eastern Orthodox churches as a chime. In the hourlong Timber, the musicians play six wooden 2-by-4s roughly 3 feet to 6 feet long. 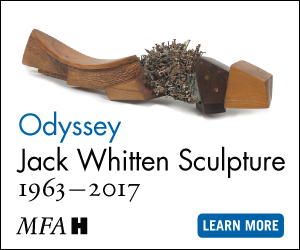 Depending on how they’re struck, the wood pieces create sounds that range from murmuring to ringing. “It’s a real tour de force,” says Craig Hauschildt, one of the six percussionists who will perform. “It’s essentially nonstop playing for about 65 minutes.” Within that span, composer Gordon creates an ever-shifting play of colors and rhythms.